As the UN’s COP21 climate talks kick off in Paris, Google has offered us a window into the work it’s been doing to demonstrate the impact humans are having on the environment and show how nonprofits are trying to stave off environmental catastrophe. 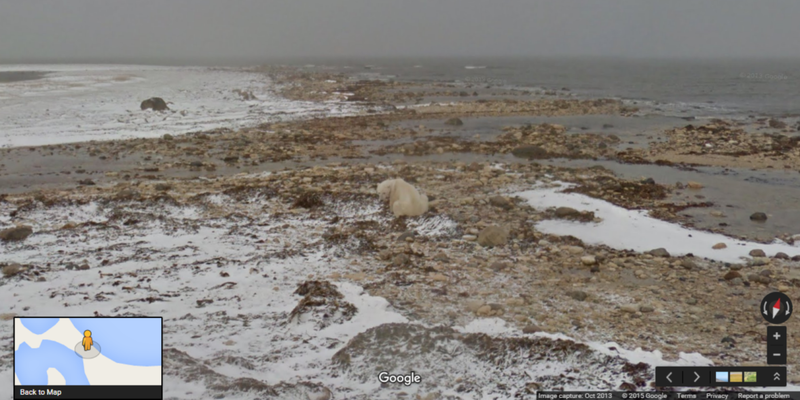 Using Google Maps’ Street View feature, you can see polar bears wondering where the ice has gone in Canada’s Hudson bay, or witness the decline in the number of blue oak trees in central California. Google offers a suit of tools for monitoring changes in the environment and understanding the impacts of climate change, including the now 10-year-old Google Earth project, plus its Google Trekker camera for mapping areas inaccessible by car. Google has also been using Web-connected monitoring equipment with its Street View cars to pinpoint gas leaks and measure pollutants in the air in the US. Despite increasing climate change scepticism in the UK at least, the former monitoring effort has led utilities giant PSE&G to commit millions of dollars to upgrade its leaky gas lines. In 2016, Google intends to use Street View cars with environmental sensing platforms to map air quality and pollution in the San Francisco Bay Area, the Central Valley and LA regions of California. Like Polar Bears International, organisations looking to get involved can apply to the Trekker Loan Program to get their hands on a backpack-mounted camera so they can start mapping the areas of the world that matter to them. For those who are keen, the campaign organisation 350.org is running a live blog of activities happening in Paris.